A possible ice volcano on Pluto (visible at center) is seen in this NASA image, captured by the New Horizons spacecraft, released on Nov. 9, 2015. The feature, called Wright Mons, is a strange feature 100 miles wide and 13,000 feet high with a summit depression at its center. New Horizons scientists suspect Wright Mons and another mountain may be signs of cryovolcanic eruptions on Pluto. NATIONAL HARBOR, Md. -- Icy volcanoes may lie on the southern rim of Pluto's frozen heart. 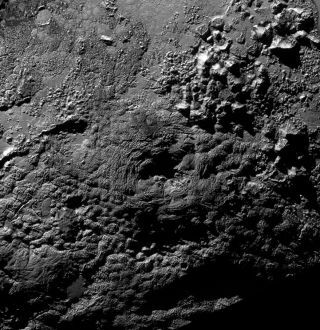 Images from NASA's New Horizons spacecraft have identified two peaks that tower nearly 4 miles (6 kilometers) high over the surface of the dwarf planet, and scientists say the peaks' physical features suggest they might be volcanoes. Two peaks on Pluto, Wright Mons and Piccard Mons, bear striking similarities to volcanoes, and scientists are wondering if the solar system's largest ice dwarf is home to cryovolcanism. A tiny, icy world at the edge of the solar system, Pluto remained largely invisible to scientists until July 2015, when the New Horizons space probe flew past it, giving humanity its first good look at the dwarf planet's surface. Before the New Horizons flyby, most scientists thought Pluto would prove to be too small to maintain the internal heat needed to power geological processes such as glacier flows and volcanism, according to scientists at the news conference. But the fast-moving spacecraft revealed a far younger surface than scientists had expected, suggesting that geological processes are taking place on Pluto, and that something must be keeping things warm beneath the surface. Two enormous mountains, spanning hundreds of miles across, sit at the southern edge of the heart-shaped region on the surface of Pluto. The mountains have been informally named Wright Mons and Picard Mons, and at their crests, each peak hosts a central crater, reminiscent of peaks called "shield volcanoes" on Earth. "Whatever they are, they're definitely weird" — 'volcanoes' is the least weird hypothesis at the moment," White said at the news conference. Although the features bear a strong similarity to volcanoes, New Horizons researcher Jeff Moore, of NASA Ames Research Field, said in an earlier session that they were not yet ready to conclusively pronounce that there is evidence for cryovolcanism on Pluto. "These look suspicious, and we're looking very closely," Moore said. Scientists don't yet know what could be generating the heat inside Pluto necessary to create a volcano on the surface. One possibility, also presented at the conference, is that an ammonia-water slurry mantle lies beneath the surface, according to a statement from AAS. The research, performed by graduate student Alex Trowbridge and professor Jay Melosh, of Purdue University in Indiana, suggests that, as cooler material sinks through the subsurface layers, hot material might rise, leading to geological activity that could include cryovolcanism. Another possibility, which White focused on, has to do with a gradually cooling rocky core, originally heated during the dwarf planet's formation. The heat required to melt ices would be significantly lower than those required to release rock, allowing the gradual mobilization of material that could, in theory, erupt through a volcano. The locations of two mountains on Pluto that may actually be icy volcanoes are shown in this montage of images from NASA's New Horizons spacecraft captured during its July 2015 flyby. The new images were unveiled Nov. 9. Though the term "cryovolcanism" has been applied to other objects in the solar system, White stressed that the features on Pluto are unique. Saturn's frozen moon Enceladus is known for spewing material from its southern pole, but the source comes from fissures in the ground rather than mountainous features. And while cryovolcanism has been hypothesized to exist on Titan, another Saturn moon, White pointed out that those cryovolcanoes were identified by radar and are still under debate. Pluto's features, by contrast, are clearly visible and bear stark similarities to Earth's volcanoes. "This is the first time where we see what seem to be tall volcanic edifices," White said. The two slopes are lightly cratered, White told Space.com, which suggests that they are younger than the northern terrains of Pluto, though not nearly as young as the "heart" of Pluto, Sputnik Planum. Scientists aren't certain of the mountains' composition, though White suggested it could be nitrogen ice. The thin atmosphere would likely allow for the fluidization of the material across the surface. The two mountains lay along the day-night line of Pluto when they were imaged by New Horizons. Picard Mons, the larger of the two features, lies in the twilight region, so it may not be possible to understand its composition with current data. But White expressed hope that upcoming data may reveal secrets about the composition of the more brightly lit Wright Mons. Even more exciting is the possibility that the two might be part of a larger field of volcanoes. White said that the close proximity of the two features might indicate that even more cryovolcanoes exist beyond the spacecraft's field of view. However, there is no way to spot them using data from the New Horizons flyby. "We'll have to go back in a hundred years and see," White said.